Karachi, like all big cities, stays in the news. The news may vary from mostly bad to rarely good. Sometimes, the events are unprecedented. Like May 12. But was May 12 unprecedented? Not at all, if judged by the scale of violence in Karachi in the last couple of decades. It was unprecedented indeed in terms of the media coverage, mostly live, accorded to this violence. The Sindh High Court took suo moto action and initiated a judicial inquiry into the massacre of May 12, 2007. On September 10, during the proceedings of the Judicial Tribunal of the Sindh High Court (SHC), hundreds of alleged MQM workers created a rumpus that resulted in the adjournment of the proceedings of the court. The lawyer community, political parties and civil society organisations have strongly condemned the party for this act of sabotaging the court's proceedings. Clashes between the activists of student organisations have recently been a routine in Karachi. At least six students belonging to the Islami Jamiat Tulaba (IJT) have been killed over the last two months, in separate incidents. Two of these students were killed on campus in the Sindh Medical College (SMC), and four in an armed attack on a mini-bus in Gulshan-e-Iqbal. The News on Sunday: What, in your mind, could be the outcome of the May 12 case, especially after what happened on the court's last hearing? And, how do you plan to deal with any untoward incident in the future? The polarisation in Karachi means that any public comment on any aspect of collective life in Karachi must follow a reaction. Human Rights Commission of Pakistan's report entitled 'A city under siege: Carnage in Karachi, 12 May 2007' released on August 27 infuriated the powers that be and has also invited immediate sharp criticism from Muttahida Qaumi Movement (MQM). The dynamics of this new medium operating as private television channels made it possible to ignore the element of fear; an element that had earlier prevented an objective and truthful reporting of events in the case of Karachi. This emboldened the reporters in print who saw it as a decisive moment and wrote what they saw. And hence the events of the day, bloody as they were, led to a sort of chain reaction. The courts were pushed to take notice of how the government allowed all the lawlessness and bloodshed in the city. A report was released by the Human Rights Commission of Pakistan, choosing to base its findings mostly on what had already been published in the newspapers. As expected, the provincial government castigated the report. The court hearing the petition on the events of May 12 was surrounded by slogan chanting 'unruly mobs'. Lawyers continued to be killed in broad daylight with a spate of student violence providing the right backdrop. Imran Khan was refused entry into the city a second time in the last few months. Enough happening in a city to merit a Special Report, we thought. The thought brought back the element of fear which, it seems, never left the city. People talked on conditions of anonymity, the reports remained undelivered. A Special Report on Karachi is only possible if it's done from Lahore, we were told. Despite our best efforts, we could not manage a version of MQM in the form of a detailed interview with Deputy Convener and Parliamentary Leader MQM Dr Farooq Sattar. This is thus a modest attempt to record what's happening in Karachi since May 12. The conditions worsened to the extent where the Attorney General of Pakistan Malik Qayyum declared that he would request the Supreme Court to shift the proceedings of this particular judicial inquiry from the SHC to some other court. A senior advocate of Karachi, on conditions of anonymity, told TNS that the proceedings of the larger bench could not be shifted to some other place. "MQM is showing panic without any reason," he said. "It is not necessary that the larger bench should complete its findings within days or months. The larger bench proceedings regarding the Nishtar Park incident are still underway." He further said that no political party could be blamed for the killing of the two lawyers until there was a strong evidence available. "For all we know, they may have been killed by a third party that wanted to exploit the tense situation of Karachi for its own interests," the anonymous lawyer added. The Sindh provincial government has also come under fire for not being able to stop violence against the lawyer fraternity in Karachi, particularly. Firstly, advocate Iqbal Kazmi, who filed petitions in the Sindh High Court on the May 12 violence alleging the MQM and the Sindh provincial government, was kidnapped and tortured by some unknown person in June. 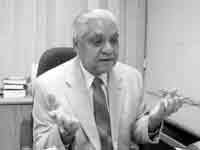 Later, on September 10, Raja Riaz, a senior lawyer and ex-vice president of the Karachi Bar Association (KBA), was shot dead just a few yards short of the Sindh High Court. He had played an important, proactive role in the movement for the independence of judiciary and the restoration of the chief justice. On September 13, another lawyer namely Atiq Ahmad Qadri was ambushed and badly wounded. Atiq gave in to the injuries and died three days later, on September 16. Secretary Karachi Bar Association Naeem Qureshi, on September 10, termed the murder of Raja Riaz as 'targeted killing', and told the media that the act was an attempt to frighten the legal fraternity. He also pointed out that Raja Riaz was killed a few yards away from the Sindh High Court building where a large number of MQM workers had gathered at that time to attend the hearing of a case pertaining to the May 12 violence in the city. Politicians including Imran Khan also came down hard on the attitude of the MQM towards the judiciary, accusing Altaf Hussain for threatening the High Court by saying that the people would give their verdict in their favour if the court did not. He further said that the MQM workers had entered the court premises at the behest of Altaf Hussain himself. "This act of the MQM proves that it's a terrorist organisation," Imran Khan declared. The lawyer community throughout the country staged protests against the killings of lawyers and the statement of the MQM Quaid. A convention of Punjab lawyers was held in Lahore in this regard on September 12. The convention condemned the killing of Karachi senior lawyer Raja Riaz Kiani, and held MQM and the Sindh government responsible for the situation. It also demanded a murder case against Altaf Hussain, Sindh chief minister, the advisor to the Sindh government, DG Rangers, and IGP Sindh. It termed Raja's killing a follow-up to the May 12 incident which had taken the lives of as many as 42 citizens of the city. Zohra Yusuf, Vice President HRCP Sindh chapter, blames the MQM for pressurising the courts and threatening the lawyers. "By doing so, they actually want to curb the independence of the courts. In this regard, they are getting instructions from Islamabad," she told TNS. "On May 12, they did not allow the chief justice of Supreme Court and his lawyers to enter the city. On the same day, the vehicle of Sindh High Court (SHC) chief justice was attacked by their workers. Later, they kidnapped and tortured Iqbal Kazmi, the lawyer who filed a petition against the May 12 carnage. Thousands of MQM workers stormed outside the SHC on September 10, and tried to influence the court workings. "The same tactics are being applied by its workers in the division bench of the SHC in Hyderabad and Sukkur," she continued. "Two lawyers who were actively involved in the movement to reinstate the chief justice were killed and many others given death threats. It's the MQM which is involved in all these incidents." According to Zohra, MQM is doing all this to strengthen General Musharraf's regime. "Even the president was quoted as saying on May 12 that the masses had shown their power in Karachi." She said the present situation is a sad reminder of the decade of 1990s. "Imran Khan has been denied entrance on the excuse that this will disrupt the traffic, but Benazir has been allowed to land in Karachi. All this shows that they are doing just what Musharraf wants them to." Waseem Aftab, a member of MQM Rabta Committee, while speaking to TNS categorically denied all allegations. A specific class in the country is trying to malign the MQM, he said, adding that theirs was the only party in Pakistan that subsisted on the middle class. Waseem further said that the MQM was being pushed to the wall. "If the otherwise disunited political parties have succeeded in developing a consensus over something, it is on not negotiating with MQM." He further said that the 'Landlord mafia' in the country could not see the party of the poor people grow. "During the recent Supreme Court proceedings, the workers of most parties have showed up with their flags, and they were also found chanting slogans in favour of their leaders within the premises of the apex court. But nobody had any objections. "Whereas, on September 10, in the SHC, the common people of Karachi went to the court just to submit their affidavits, and they weren't carrying any pictures or party flags." He also said that Malik Qayyum's statement about shifting the proceedings of the tribunal from the SHC to some other place was actually meant to give the whole matter a very serious colouring. "We do not agree with his views." He declared once and for all that MQM respected the lawyer community, "Advocate Atiq Ahmad Qadri was a well-wisher of MQM. Those (lawyers) who have a political affiliation with the MQM are being targeted and tortured, and the bar councils are suspending their memberships. Is this justified?" He said that on May 12, the roads around the SHC were blocked on the request of the SHC Bar Association, and its president Abrar Hasan also admitted that. "The MQM was a victim of the May 12 carnage. Our 14 workers were killed on that day. We have released their names with complete home addresses. But, it is really horrible that the victim is being blamed" he said. According to him, there are elements in Karachi that are trying to create a situation that could lead to ethnic clashes between the Pathans and the Mohajirs. "They are trying to exploit the situation," Waseem added. According to Riaz Ahmad, Secretary Information Islami Jamiat Tulaba Karachi, "MQM and All Pakistan Muhajir Students Organisation (APMSO) are behind most of the killings." Riaz Ahmad was talking to TNS. He alleged that the MQM had set up torture cells in Sir Syed University and Aligarh Institute. "Hundreds of IJT students have been abducted and tortured badly at these places. Just today, three workers of IJT were kidnapped." He added that thus far the police had not registered a single FIR of any of the above mentioned incidents, "On September 13, three of our workers were killed in front of the Jamia Karachi, and you will be surprised to know that the police has nominated IJT workers in the FIR of the incident." He alleged that both the university administration and the police were playing into the hands of the MQM. "We've already launched a peaceful campaign protesting MQM's violence against students." On the other hand, Kunwar Khalid Yunus, MNA and central leader of MQM, maintains that all these allegations are false. "Basically, it is the IJT that believes in using harassment tactics in the educational institutions," he declared, talking to TNS. "Their role in the Punjab University is public knowledge." The IJT wanted to create an atmosphere of terror in the Karachi University also, but the APMSO wouldn't let them, he added. "On September 12, the IJT activists badly injured a female student of the APMSO in KU. The poor girl landed in the hospital where she is still fighting for life." According to Kunwar Khalid, the fact that three IJT workers were killed in the September 13 incident was true, "But it is not yet clear as to who is behind the killing, and therefore to blame either MQM or APMSO would be a fallacy." He went on to relate how, only a few days before the incident, two workers of the IJT were killed near the Jinnah hospital, by an ethnic students organisation. "But nobody is talking about the incident, because people know who is the killer. Whereas in cases where the offender has not been identified, everybody starts blaming the MQM or the APMSO." Exploitation of college and university students in the name of politics at campus is not a new phenomenon. Pakistan had its first real taste of it after Field Marshal Ayub Khan came into power and martial law was imposed in the country. Student organisations like National Student Federation (NSF) and IJT were active bodies then, and participated in the political issues of the country. Gradually, with the emergence of a host of fresh student organisations, the role of the NSF became minimal. The '80s saw Gen Ziaul Haq (late) backing the IJT for his own vested interests. Other student forces that were against the martial law were crushed badly in the process. Karachi was a popular battleground for students in those days, and the students were common casualties in government-supported ambushes and clashes. Weapons entered the campus in their full glory during that time. Political parties only took off from where Zia ul Haq left. Decades later, IJT is still a force to reckon with, while the APMSO is also claiming dominion big-time. People's Students Federation (PSF), PPP's student wing, is active too, though relatively less powerful, and so is the Pakhtoon Students Federation. Any changes in the country's political climate have a direct bearing on these student organisations. When MQM became a part of the coalition government in federal as well as Sindh and also emerged a strong supporter of Musharraf, while the Jamaat-e-Islami held its own against the policies of the president, this brought the traditional rivals face to face with each other. It is interesting to note that only three years ago, a meeting was held at Sindh Governor House, Karachi, in which the provincial administration proposed a plan for a patch-up between the IJT and the APMSO. The situation was alarming at that time, as both sides were engaged in a fierce gun battle in more than 20 educational institutions in Karachi, and the administration had proved helpless because of political pressures. And finally it was decided to call the leaders of both students organisations to patch up with the support of 'concerned quarters'. Abrar Hasan: The mob that appeared before the court to file their affidavits was not concerned with the proceedings of the said case, since it was not an inquiry. In fact, the matter was taken up to find scapegoat in the government functionaries who had failed to dispense with their duties as per the law and their oath. These people appeared in the court perhaps on 'instructions', as there were MNAs and MPAs of the ruling party to be found at the place. Imagine, what would happen if the courtroom with a capacity of 60 persons was swarmed by a crowd of 600? And, precisely what would happen if this trend caught on, and more and more people started thronging the courts? The court would turn into a battleground for sure. In all probability, a crowd that showed up on a previous hearing will re-appear on the next date of hearing -- that is, September 24. And, if they are not allowed to enter in the court premises, they are most likely to form an assembly of sorts and create trouble. We asked the chief justice to deploy Rangers and police around the boundary walls of the court, and to ensure that snap checking is made at a fair distance from the place so that any untoward incident can be averted. In my opinion, the entry of litigants during the May 12 incident proceedings should strictly be on passes issued by the court, and this is the order that has been passed by the SHC Chief Justice. TNS: The court's authority to hear the May 12 case has been questioned by the government counsel and some political leaders. What is your take on that? AH: The court has taken notice of the complaint of the Sindh High Court Registrar, and it has been converted into a constitutional petition. The entire population of Karachi is aggrieved as it was deprived of its fundamental rights on May 12. The court has the jurisdiction to hear the case about the failure of the government law enforcement agencies to control violence in the city. The court has to examine as to why permission was granted to a political party for holding rallies in the city despite apprehensions of bloodshed, on May 12. TNS: What are the issues with the lawyers of the City and High courts today? Are they apprehensive of being mistreated, tortured, and even killed, ever since the SHC initiated suo moto proceedings to this effect? AH: Pervaiz Akhtar Kiyani, a member of the Malir Bar Association, was killed while several others were injured, at the hands of the armed persons, as the lawyers' convoy was heading towards the airport to greet the chief justice on May 12. All prominent advocates who took part in the struggle for the independence of judiciary today fear an attack on their lives. Several FIRs have been lodged by advocates, especially lady advocates, for assault on their person. Two more members of the Bar -- Raja Riaz and Atiq Quadri -- were recently killed by the armed persons. The killing of Raja Riaz took place in broad daylight and near the spot where the Rangers and the police are usually stationed. But no one has been apprehended as yet. Those involved in the killing of Atiq Qadri are also at large. I'd call these incidents as target killings. I would caution all those advocates who participated in the struggle and movement for the independence of judiciary against any lapse of security on their part. They ought to take extraordinary care about their safety, because the administration will not cooperate with them in such matters. TNS: What do you have to say about MQM leader Altaf Hussainís comments against lawyers, that were printed in a section of the press? AH: It is evident that advocates, unlike many of our political leaders, are patriotic and law-abiding citizens. Their struggle is only for the independence of the judiciary, the supremacy of the constitution, and the establishment of the rule of law, and they donít have any political ambitions. Hence, any derogatory remarks against them are simply uncalled for. Those people who are using abusive language against the lawyers should apologise the entire nation. TNS: What is the pace of the proceedings with regard to the May 12 siege of courts in the Sindh High Court? AH: The case is now before the larger bench of seven judges in the Sindh High Court, and all parties have already submitted their replies to the questionnaire that was formulated by the full bench. Films and CDs have been submitted by different TV channels in the High Court. As the High Court is exercising its constitutional jurisdiction in the matter, perhaps no evidence will be recorded and the High Court after seeing the films and the CDs and going through the replies, affidavits and counter-affidavits will hear the parties about placing the responsibilities for the events. The High Court may also give its recommendations for avoiding such incidents in future. TNS: What is your assessment of the violence and bloodshed that took place in Karachi on May 12, 2007, on the occasion of the CJP's arrival in the city? AH: As we know, the chief justice had to address the members of the High Court Bar on the occasion of the 50 years of Supreme Court. It was decided that he will arrive in Karachi on May 12, from Islamabad, at about 12.00 noon. First, he was to go to the Malir Bar Association for a short address, and later proceed to the Mazar-e-Quaid from where it was off to the Karachi Bar for a short address and, eventually, to the High Court. Unfortunately, the government of Sindh allowed the political party that is in power in the province to hold a rally. Containers were placed all over the city to block the road leading to the airport, and to block any access to the High Court. Armed people were posted on different sites at Shahrah-e-Faisal. They shot at people indiscriminately which resulted in more than 50 killings. The law enforcement agencies, on the other hand, did the disappearing act at the moment. In my very firm opinion, the government of Sindh is squarely responsible for whatever happened on May 12. TNS: Do you have any plans to record the events that took place on May 12 and after -- till date? AH: Yes, I propose to write a comprehensive book on all the events. A few books have already come out, and others are going into print. In a press conference held on August 28 by the MQM Rabita Committee (RC) Dr Farooq Sattar, the Deputy Convener of RC, reportedly said that Ms. Asma Jehangir, Chairperson of HRCP had told the MQM leadership on May 11 about the bloodshed that would take place on May 12. He demanded that Asma Jehangir should clarify her position as she had information about the bloodshed which means they could say that she was part of the conspiracy. He said that the HRCP report amounts to contempt of court because "the case is proceeding in the Sindh High Court". He also termed the 'partial' report as a 'bundle of lies'. He did not explain why MQM had kept the 'knowledge' of Jehangir's alleged involvement in the 'conspiracy' till the release of the report. It is also not clear if MQM is going to present this 'evidence' of Jehangir's alleged involvement in the conspiracy before the Sindh High Court. What is it in the report that hurt MQM and prompted such an immediate and sharp reaction? It was the day when the then 'dysfunctional' Chief Justice of Pakistan was scheduled to arrive in Karachi and attend a Karachi High Court Bar function at Sindh High Court building. Many political and civil society groups had announced to welcome the CJP at various spots on his way to the SHC building. The federal and the provincial administrations were against this visit for obvious reasons. Closer to May 12, MQM gave call for a rally of its own, and things started taking a fearful turn thereafter. What happened in Karachi on May 12 was witnessed not just by the people of Karachi but people all across Pakistan live on television sets, and it was just as widely reported in newspapers all around the world. The mayhem on that day left around 46 people dead many of whom target killed by organised killing squads and others got caught in the cross fire between rival groups. Those who got killed belonged to all ethnic groups living in Karachi. Indeed, live television telecast caught some of the killing squads using their fire arms indiscriminately and people all across Pakistan saw this happening instantly. This experience has left wounds and scars which are yet to heal, thus the sensitivity. The HRCP report is about the happenings in Karachi on 12 May 2007, which has been called by many as 'the Black Saturday' in Pakistan's history. "In sum, the primary responsibility (both in terms of omission and commission) must lie with the organs of the state -- federal, provincial, and military. The MQM, or at least its military organization, bears the direct and specific responsibility for the majority of the violence. Residual responsibility lies with the armed supporters of other political and religious parties." The report recommends among other things setting up that an inter-party parliamentary body must be set up to probe May 12 events, fix responsibility for murder, arson and lawlessness and pave the way for punishing the guilty. It says this must be done in view of apparent and proven involvement of elements that are in or are close to the government. The report is spread over 124 pages out of which about 35 are allocated to make sense of the events and describe patterns of action and the response of various players present or active in the events. About six pages are given to the conclusions and recommendations. Major portion of the report spread over the rest of pages in small print is devoted to the newspaper clippings from reputed national newspapers. The description of events in the early part of the report is well referenced and is supported by 137 footnotes. Out of these 137 references, about 13 are based on data and accounts gathered by the HRCP fact finding mission, which is directly or indirectly corroborated by the accompanying newspaper reports cited. It seems that HRCP's own data has been relied upon less than the reports already available in the public domain thus attempting to make the report on the extremely contentious events of May 12 more readily acceptable/reliable and least questionable. One may ask if so much of information was already available in the newspapers and on the internet, what was the use of getting it together in the form of a report? The report itself answers the question by stating at various places that this has been done to serve as a context for future reference, a lesson for posterity. The report asserts that May 12 represented something quite unprecedented in the history of Pakistan. 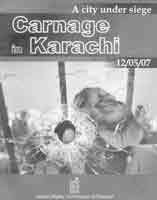 Though in quantitative terms well over 40 people lost lives and the number of injured ran into hundreds, however, in terms of the fear that engulfed the city of Karachi that day was without historical comparison. It was "the day when State withdrew" and the spectacle of a disarmed police force operating on the directions of armed cadres was observed. All the great details need not be repeated.